You won”t be able to either after trying this recipe. We”ve created the perfect pierogi that you can make with relative ease in your own kitchen. The ingredients are easy, and work is fun – even for kids to help out with and they don”t take very long to cook. Trust us, these are the best pierogi”s you”ve ever savored. Cook 6 strips of bacon until nice and crispy, set aside on paper towel. Boil Potatoes for approximately one hour to one and a half hours. Drain boiling water from around potatoes. Add some butter, milk, salt, pepper to potatoes and begin mashing the potatoes. Mash mash mash, make those mashed potatoes. You want them super creamy. Set your mashed potatoes aside to cool down a bit. Mix everything together in your mixing bowl so you have a crazy mashed potato concoction. Let the mixture sit on the counter for a bit to mingle the flavors and solidify a bit for easier stuffing. Add some vegetable oil and cut up Spanish onion to your large pan. Begin simmering onions while you make the pierogis. Add about a tablespoon of filling to your wonton/potsticker wrap and gently fold over and seal the edges. This part is a little tricky but after you do one or two you”ll know how much filling to use and how to close them properly. If they won”t close properly, you can use some flour and water as glue on the inside of them to hold them shut. Once all your pierogi”s are ready to be cooked, fill your heated pan with the oil and onion with as many pierogi”s as you can. Cook slowly until golden brown on both sides. 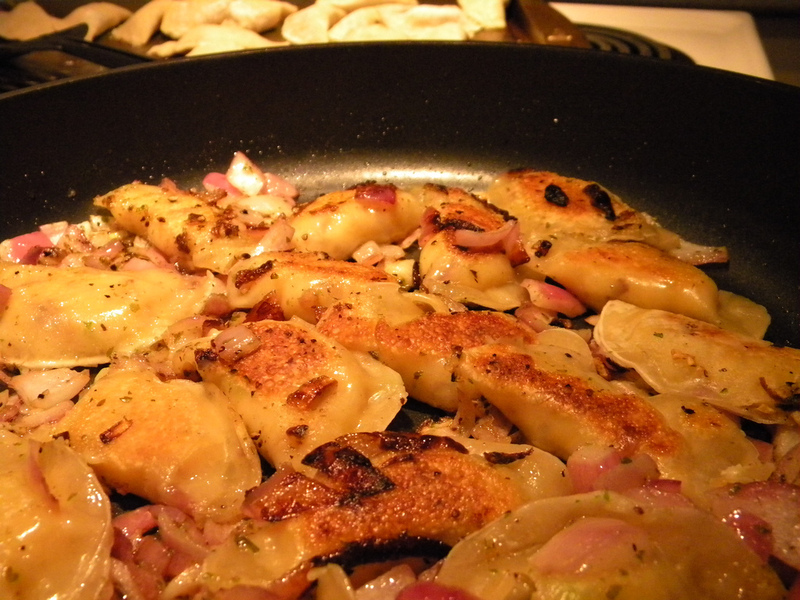 Near the end, turn up the heat to add crispyness to both the onions and pierogies. We find the onion tastes best if a little blackened. Serve with Sour Cream and Parsley for dipping.